Ren & Stimpy creator John K keeps a blog on which he discusses various matters relating to cartooning. From reading it somewhat regularly, I’ve learned that there’s a great deal about animation that John K doesn’t care for, and he usually has a well-thought-out argument for why the given thing shouldn’t be the way it is. 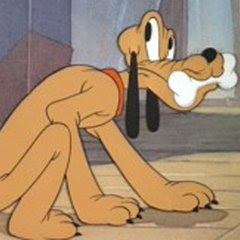 Last month, he took on a subject that I’ve quietly pondered since I was a kid: Disney’s dogmen. You know what I’m talking about if you watched Ducktales — and no, I never expected to be writing about Ducktales with such frequency in 2009. The show featured a few dogmen prominently: Duckworth, Scrooge McDuck’s stuffy buttler, and the Beagle Boys, the group of criminals who are constantly trying to steal from Scrooge. 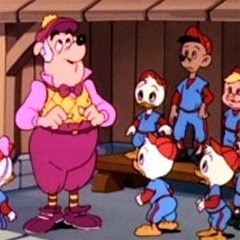 They’re clearly not ducks, as most of the Ducktales characters are, but they’re not fully dogs — at least not in the style of Goofy or Pluto, those two canines who populate Donald Duck’s universe and, thus, could presumably have reason to meet Duckworth and the Beagle Boys. left: beagles boys. right: duckworth. left and right: horrifying dog men. left: goofy. right: pluto. left and right: cartoony dogs that nonetheless look like dogs. As John K points out, the dogmen are pretty damn horrifying. Grotesque in the traditional sense, they have human faces with dog noses placed on the vaguest hint of a snout. And sometime not even that. Some have strange, floppy, fleshy ears. Others have more human-shaped ears. Either should rightly creep you out. Can anyone explain why this existed? The only thing I can come up with is that conservative cartoonists felt a bit guilty about drawing regular funny animals that walked and talked (because that makes no sense) — but their jobs demanded it. Donald, Mickey, Bugs and all the animated cartoon stars were very cartoony and easy for the audience to suspend their disbelief, but maybe not so easy for the more conservative of the comic artists — so when they got to create their own incidental characters from scratch, they naturally drew more "realistic" and sensible humans in clothing — but then — so as not to alert Walt to it - at the last second, they would paste a dog nose or pig snout onto the human to trick their bosses into thinking that these were also funny animals that matched the style of the popular star characters. It’s probably more likely that it was unconscious conservative auto-pilot drawing, never realizing how much more bizarre half-way cartoon characters are. The reason I suspect conservatism as the culprit is that if it wasn’t, there would be many funny variations on the idea. How about a realistic dog that stands on his hind legs but has a human nose? Or a man with Crab eyes? A filter-feeding flesh colored shark that walks on realistic human legs with no pants, but a tuxedo jacket and a duck beak on top of his head? How about an eel in a Burka? I mean, this could go on and on. It has limitless potential for fun. Something worth thinking about, at least if you’re still plagued by memories of Ducktales. The original post generated quite a discussion, with commenters weighing in on this and that below. One of the thats merits a mention here, I felt. 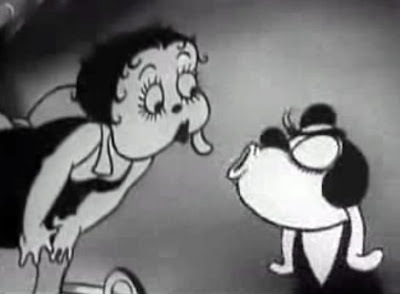 The concept of dogmen wasn’t just limited to Disney franchises, and the proof is Betty Boop’s first ever appearance, in the Talkartoon short “Dizzy Dishes.” Boop pops up at a singer in a restaurant club populated by anthropomorphic animals. She looks more or less the same as to what she looks like today, save for those creepy, fleshy, floppy dog ears. Wikipedia claims she was initially designed to be an anthropomorphic dog. She shows up at about the 2:20 mark. I have provided a still below for the lazy and impatient. I’d like to think this explains Betty Boop’s bizarre head shape, but I’m not sure it does. I was never really bothered by the dog-people, but there were things I wondered about them, mostly why they looked even less like dogs than Jiminy looked like an actual cricket. 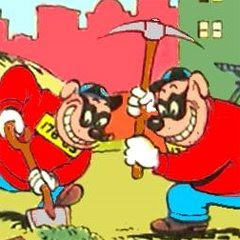 And if the Beagle Boys looked like ANY breed of dog, it certainly wasn't the beagle. Why was Duckworth called that if he was the only member of Scrooge's household who WASN'T a duck? I'm trying to remember whether DuckTales had any anthropomorphic animals other than ducks, dogs, and pigs. I know there was at least one wolf (although I guess that's a kind of dog), and Darkwing Duck (which was supposed to take place in the same universe) had a walrus as a recurring villain. Nathan: I don't remember pigs on the cartoon. Were they actual characters or just red shirts populating the background? Darkwing Duck expanded the number of species quite a bit, even if the majority of the cast was still waterfowl. There was a walrus villain and an evil bull and a rat and a dog, from what I can remember. (The dog was made out of water, for reasons I cannot remember.) Maybe St. Canard is a bit more racially integrated than Duckburg. Boop Girl: So you're saying Helen Kanes had fleshy, floppy dog ears? That's quite disrespectful. I seem to recall there being a pig on DuckTales who was a ship captain, but he only appeared in one episode. 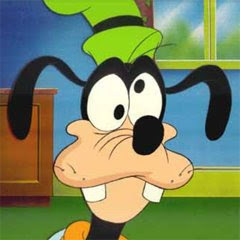 I remember that the dog villain on Darkwing Duck was called the Liquidator, and that he was originally flesh-and-blood (I think he owned a bottled-water company), but I don't remember his exact origin story. I think I read that they didn't really use him very much, because it was hard to think of ways for Darkwing to defeat him.